MFI renders practical teachings of divine love. The teachings of His Divine Eminence Lord Ra Riaz Gohar Shahi emphasise on the importance of enlightenment of the heart. The heart is a pumping station and circulating blood is its main function. On top of it sits a spiritual subtlety, the Spiritual Heart (Qalb). Once initiated with divine energy and enlightened, its function is communication with God. His Divine Eminence says, ‘Any name alluding to God is worthy of great respect and it directs one towards God. Different religions call upon God with different names in their languages. However, in order to reap the fruit out of this sacred practice of repeating the name of God, the name must be synchronised within the throbs of the heart; that is how the divine energy is produced. The heart is a pumping station; it purifies the blood and circulates it throughout the whole body. When the name of God is synchronised within the throbs, divine energy starts to be produced within the heart and the heart then circulates the divine energy throughout the whole of the body. The souls are concealed within the blood and are awakened when the blood becomes enlightened. The revival of the heart and the act of engaging it in God’s remembrance is known as Invocation of the Heart, Simran or Dhikr-e-Qalb (Qalb-e-Saleem). His Divine Eminence Ra Riaz Gohar Shahi has appointed His Spiritual Ministers to promote the practical teachings of divine love. This sacred elixir of the heart is granted to the entire humanity without prejudice to any religion, any nation, any faith, any cast or creed. The divine facility is granted to all humanity equally. There is no fee; it is absolutely free. This divine gift can also be obtained through the miraculous image of Lord Ra Riaz Gohar Shahi on the Moon. MFI endeavours to wipe out hatred from the society and from the hearts of all humanity by raising the awareness of the long forgotten spiritual science among all religions. Society has become corrupted owing to modifications made within all religions. The spiritual system has been destroyed in almost all religions; people have shunned the quest of obtaining inner purification and enlightenment. Morality is increasingly on the decline. True spiritual values have all but diminished. Mutual love, faith, unity and brotherhood have faded away from the society. Religiosity has bred contempt. Every religion considers itself to be the best among the rest and due to this rivalry, hatred has consumed their hearts and minds. The inner evil instinct in human beings continues to grow as terrorism, extremism and fanaticism rise to dangerous levels, and this is solely because of the lack of spirituality and connection with God. The religions no longer provide sustenance and spiritual nourishment to hearts and souls. It is impossible to reach God through religion. As God does not have a physical existence in this phenomenal world; hence God must be sought through spiritual means. God cannot be associated with physical bodies. MFI’s goal is to help diminish devilish instincts in all human beings by providing humanity with means of inner purification and spiritual enlightenment. By rendering spiritual assistance to all religions to recognise and approach the Essence of God by virtue of adopting the Mystical Doctrine of Lord Ra Riaz, MFI aims to beautify and unify the hearts and souls of all humanity. 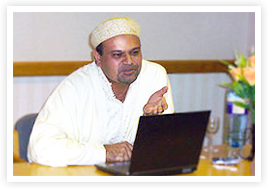 Mehdi/Messiah Foundation International (previously RAGS International, founded in 1980) was formally established by the Representative of His Divine Eminence Ra Riaz Gohar Shahi, His Holiness Younus AlGohar under the guidance of His Divine Eminence in the year 2002. The first centre ever established was in London, United Kingdom, which is also the headquarters of MFI. Today we have grown to include centres in many countries including Nepal, Canada, the United States of America, Australia, South Korea, Japan, Sri Lanka, India, Bangladesh, Pakistan, and Greece.